Our current parking spot is Bridgeport, Texas, a small town marked by white trucks and blue collar workers. A few excellent restaurants, most of which close early, they only need to accommodate the lunch crowd. My recommendations are Rock City, Casilla’s and Brandee’s Country Kitchen. Another thing I like about Texas, and truly most places in the South, is that most small towns are built around the square. Almost every town has one, a central square that is surrounded by shops and cool buildings. In Decatur and Jacksboro, there is a court house in the central square, in Chico – not much of anything anymore, but the concept is still there. The square is the center of the city. 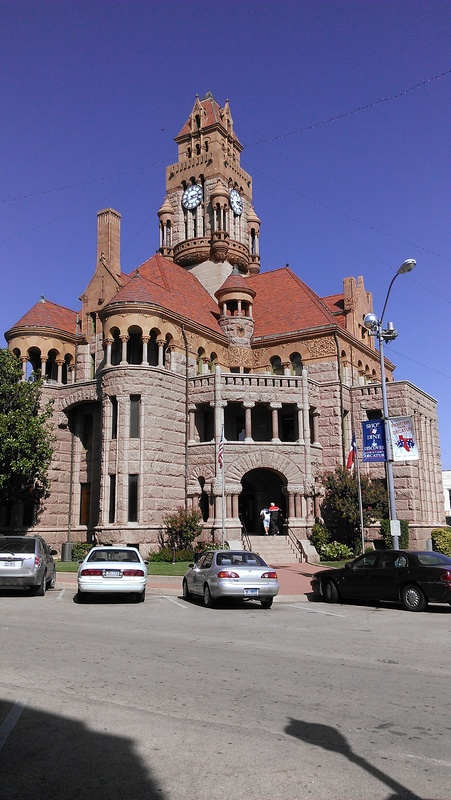 Decatur has a beautiful square, the courthouse for Wise County is there, and the buildings all around the square are historic with their histories shared for all to see. One of my favorite steakhouses is on the southeast corner, Sweetie Pie’s Ribeyes – fantastic chicken fried steak there. Continuing on the Southeast side were three antique stores and a music store. Another turn to the west and along the north side was a gift store and a thrift store; going south and then back east were dotted with clothing and furniture stores, but the main theme was food. Half a dozen restaurants filled in the square. The best part – no empty buildings. I love shopping local, too bad, I really don’t need stuff, there was plenty to be had. I intend to keep exploring the little towns of Texas, I haven’t found my favorite yet, but there are several on the list.